Summer is on its way and you know what that means? No longer is the ponytail reserved for rainy days and late mornings, but is a carefree go-to. Here are some ponies we stumbled upon on Instagram to get you inspired to ditch the curls and go for the pony! This waterfall braid, held together in a pony by Hairpics has had us practically drooling. As long as you know how to do the waterfall braid, we promise it’s easy to recreate! Summertime should be about carefree beauty… no one wants to be a slave to their blow dryer or flatiron in the hot weather! Try these celeb-inspired dos that are quick and easy to style, but look super chic. When we’re racing out the door, we love to add a small headband braid for a more put-together look. The key is to french braid the small section on the hairline and then braid the rest down to line the face. Use a sea salt spray such as John Masters Organics Sea Mist Sea Salt Spray with Lavender ($16.50, beauty.com) to get those beachy waves. Long hair is one of the most sought-after styles for women. Are we really surprised, though? From a young age, girls are taught that a good head of hair can not only land you a prince, it can save your life (Thanks, Rapunzel!). In many cases, though, long hair is easier said than grown, so we turned to some of the leading stylists to get their tips for growing long, luscious strands. Once you’ve gotten a trim, make sure to use a leave-in serum, like White Sands The Cure 24/7 ($29.99, Whitesandsproducts.com) or TRESemmé Split Remedy Sealing Serum ($5.49, Walgreens.com). This will help further restore your hair and prevent split ends. Bucco-Regazzi also recommends going to the salon once or twice a week for a deep-conditioning treatment, but if this isn’t in your budget, try an at-home treatment, like CHI Rx Moisture Therapy Conditioner ($8.99, Drugstore.com). Not only does this conditioner feed your hair vitamins to make it stronger and resilient to damage, but it helps keep hair looking shiny. It seems like the real hurdle to long hair, though, is patience. It’s that in-between length that sends us back to the salon chair for a shorter ‘do. With these tips and products, we might actually get the extra long hair we’ve been craving. Are you growing out long hair? Which Celebrity Is Shaving Her Head? Try On Long Hairstyles In The Makeover Studio! Braids are one of the hottest trends these days, and nowhere is that trend more apparent than in Hollywood! Celebrity moms like Jennifer Garner and Jada Pinkett Smith are sporting braids of all varieties, and their daughters are taking note. 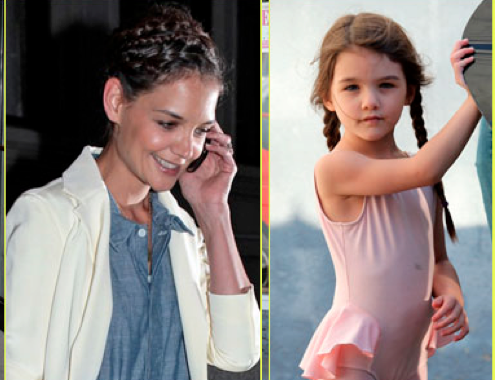 Mini fashionistas like Violet Affleck and Ava Phillippe are copying their A-list moms and rocking braids, too. We finally made it the most glamorous awards show of the year: the Oscars! Just as we expected, we saw some gorgeous gowns and amazing hairstyles. While we can’t help you score a vintage Dior dress, we have great tips to get your hair looking red-carpet ready. Wella Professionals was responsible for some of the best looks of the night, and now their celebrity stylists are sharing their tips on how they created these hot Hollywood hairstyles. To Get The Look: First, start by applying Sebastian Professional Mousse Forte to wet hair, then allow it to air dry. With a small round brush, finish off with a blow dry that gives the hair more height, then use your hands to set the part and bangs. Finish the look with Wella Professionals Stay Essential Finishing Spray to set in place. Hollywood’s “Night of Nights” is right around the corner, and while we don’t know who will take home the oh-so-coveted Oscar Awards, we do know that all you beauty junkies out there will be mentally casting your vote for Oscar superlatives – who has the best dress, the best accessories and of course… who has the best hair? “Wella Professionals Velvet Amplifier is a red-carpet favorite,” adds Celebrity Stylist Andy LeCompte, “that smoothes the hair surface so it can better prepare the hair for styling.” Andy also uses Wella Professionals Shimmer Delight Shine Spray on his clientele to create the most sheen and expensive looking finish to any end look. LeCompte predicts that celebs will lean toward classic styles with a play on texture and symmetry. “There will be a lot of deep side parts and loose ponys, bobs and chignons tied to the side.” This style can be customized to accentuate any gown, face shape or hair accessory. “It also lessens the stuffiness of that prom feeling and adds a more up-to-date, laissez-faire feeling. Can’t wait till then? Visit the red carpet tab on Wella’s Facebook page for tips and leave questions for their experts to answer. OK, so ombré’s been around for awhile–but there’s a reason why: The two-toned look works on anyone. Whether it’s golden streaks like Rachel Bilson’s, or warm caramel highlights for a blondie, the ombré look is great for enhancing hair color without the commitment of a full dye job. This is one hair trend we won’t might bringing into the New Year. Half-buzzed hairstyles certainly had their moment this year. From Cher Lloyd to singer Cassie to Project Runway winner Anya Ayoung-Chee, it seemed like the shaved ‘do popped up just about everywhere. Unfortunately the half-buzzed hair, looked just that: half-done. Leave it in 2011.